Update #2: As of March 2013, Obama has increased the national debt by more than $6 trillion. There are no signs of stopping! Obama keeps striving to split-up America: his divisiveness and partisanship get more extreme by the day. As he keeps pushing his unconstitutional/corrupt “gun control” agenda, Barack “Great Orator” Obama has a few choice words: Republicans are pointing “a gun at the head of the American people” during debt ceiling negotiations, according to Obama. In other words, Obama has nothing intelligent to say in response to Republicans who are desperately trying to prevent Obama from spending the United States into more hopeless debt slavery. Since Obama lacks any coherent argument in favor of more spending, he’s decided to stoop to this lowest of levels by equating rational economic policies with mass murder. Just as he surrounded himself with children to help ensure that Americans would support his irrational gun control agenda, he has literally demonized Republicans to silence opposition to his out-of-control government spending. Obama even went so far as to claim that Republicans are “suspicious” about programs that feed poor children and Social Security. Obama’s rhetoric is not only patently false and inflammatory– it’s monstrous, because Obama is seizing more executive power through lies. Update: How comforting: The White House has raised the terror threat and warned that illegal immigrants could flood the borders due to sequestration. Of course, Republicans have pointed out that Obama “is setting up “a false choice” between tax increases and security. They said the other alternative is to make $85 billion in spending cuts in other parts of the budget, rather than the across-the-board cuts that make up the sequester.” Obama apparently believes that U.S. national security should be sacrificed so that he can continue wasting American taxpayer dollars (giving paid time off to federal employees so they can spend their time helping unions instead, spending hundreds of millions of dollars on lavish “conferences”, refusing to use $45 billion in unspent taxpayer dollars to offset the $85 billion in sequester cuts, spending money to “find advancements in beef jerky from France” and conduct research to determine “what lessons about democracy and decision-making could be learned — from fish”, and so many other ridiculous things) while maintaining his own paycheck. Tellingly, it was Obama who first proposed the idea of the sequester— “legendary journalist Bob Woodward… who made his name and reputation in reporting the Watergate scandal that led to the resignation of Richard Nixon… noted—as he has before—that both President Obama and his would-be Treasury Secretary Jack Lew lied on the campaign trail by saying the sequester originated with House Republicans. Update #2: And just to show they aren’t kidding: “The sequester is officially still three days away, but the Obama administration already is making the first cuts, with officials confirming that the Homeland Security Department already has released several hundred illegal immigrants from detention“— they’re refusing to confirm “how many immigrants were released or how they were selected.” However, it was subsequently revealed that Obama’s Department of Homeland Security plans to release 5,000 illegal immigrant detainees due to sequestration. Obama’s Department of Homeland Security is also planning to furlough 5,000 border patrol agents. Now, the Obama’s U.S. Federal Aviation Administration says it will furlough air traffic controllers (because clearly, Obama’s urge to spend is more important than air safety). According to the House Armed Services Committee and Army Chief of Staff, the Marine Corps will lose 57,000 soldiers, “by the end of calendar year 2013, less than half of our ground units will be trained to the minimum readiness level required for deployment,” the Army will lose 143,000 soldiers, 78% of Army units will “significantly curtail training,” the Navy will delay the deployment of an aircraft carrier, and there will be a 20% pay cut for 800,000 civilian employees working for the Department of Defense. U.S. Attorney General Eric Holder claims “the Justice Department will be handicapped in some of its most vital missions to prevent terrorist attacks and crime” with furloughs of FBI agents, ATF agents, DEA agents, prosecutors. The infamous Democratic Congresswoman Maxine Waters claims that 170 million jobs could be lost in America— a ludicrous claim, considering that the total U.S. population (including children and the elderly) is 315 million as of February 2013. Obama’s Education Secretary Arne Duncan has been caught lying about teachers getting pink slips because of the looming sequester. Obama himself was caught lying about U.S. Capitol janitors and security guards getting a pay cut. After 4 years of blaming Republicans for all of the country’s problems, bullying his political opponents, and spewing vitriolic rhetoric against Republicans, Obama has apparently crushed Republican leaders into submission on the sequester: “Days before the March 1 deadline, Senate Republicans are circulating a draft bill that would cancel $85 billion in across-the-board spending cuts and instead turn over authority to President Barack Obama to achieve the same level of savings under a plan to be filed by March 8. The five- page document, which has the tacit support of Senate GOP leaders, represents a remarkable shift for the party. Having railed against Senate Democrats for not passing a budget, Republicans are now proposing that Congress surrender an important piece of its Constitutional “power of the purse” for the last seven months of this fiscal year. As proposed, lawmakers would retain the power to overturn the president’s spending plan by March 22, but only under a resolution of disapproval that would demand two-thirds majorities in both the House and Senate to prevail over an Obama veto.” The Constitution demands checks and balances– the Republican Party’s leadership is inexcusably weak. Obama openly admits that he doesn’t care about the Constitution’s separation of powers, and weak Republican leaders are violating their oaths of office by enabling Obama to get away with being a tyrant. The Founders of America designed our system of government around the concept of Liberty– less than 300 years later, we have a U.S. President who is unchecked by an opposition party that has disgracefully surrendered. After conservative talk radio host Alex Jones debated gun control with liberal CNN reporter Piers Morgan, CNN aired a show in which liberals (including Piers Morgan) laughed and fantasized about the idea of shooting Alex Jones. There have also been dozens of open threats of violence made against conservatives by oh-so-peace-loving liberals who want “gun control,” but Obama’s Department of Homeland Security is too partisan to take any action against them. Obama’s Department of Homeland Security only targets right-wing American citizens. What is going on with Democrats? 1. 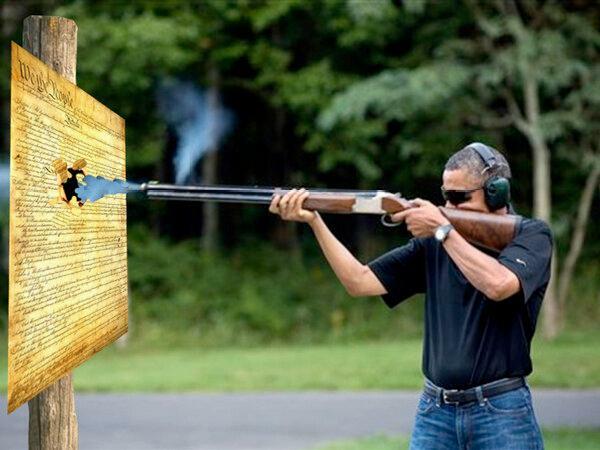 We have VP Joe Biden advising Americans “if you want to protect yourself, get a double barrel shotgun… Buy a shotgun! Buy a shotgun!” with his typical crazy-eyed look. 3. 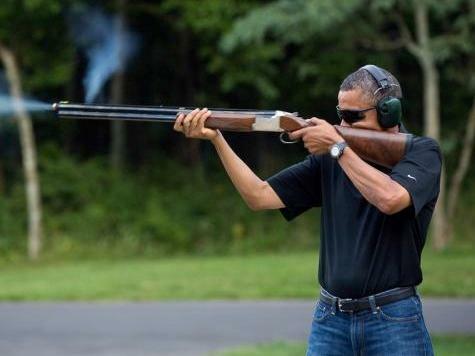 Obama is wasting everyone’s time by responding to recent gun violence by “calling on research on the effect of media and video games on gun violence.” Hmmm I wonder… could there be any correlation?? This is a topic that’s already been extensively researched, and the research results are common sense. Furthermore, Obama’s unconstitutional, counterproductive anti-gun policies only serve to make it look like he’s taking meaningful action. All the gratuitous, desensitizing violence in the entertainment industry is a mere footnote to Obama— it’s not a central part of his gun control discussion because Hollywood supports him politically. The IRS has announced that under Obamacare the cheapest health insurance plan available in 2016 for a family will cost $20,000 for the year. Obamacare will push 7 million people out of their job-based insurance coverage — nearly twice the previous estimate, according to the latest estimates from the Congressional Budget Office. Oops: Obama’s “pathway to citizenship” for illegal immigrants could increase the projected cost of Obamacare by $300 billion over the next decade, according to the Republican side of the Senate Budget Committee (which based its calculation on the Congressional Budget Office’s estimate that 7 million illegal immigrants are without insurance and 85% of them have incomes low enough to qualify for Obamacare benefits). Wow, the Democrats really screwed up on this one– after disregarding the Constitution and passing Obamacare without reading the bill (since Democrats know what’s best for the American people, who can’t take care of themselves– right? ), their constituents are confused about why they’re experiencing rising costs and higher insurance premiums because of Obamacare. Update: Democrats trumpeted Obamacare as bringing an end to “discrimination against Americans with pre-existing conditions.” Well, that didn’t last long! Just as the provisions of Obamacare are starting to take effect in 2013, we’ve been told that “Tens of thousands of Americans who cannot get health insurance because of preexisting medical problems will be blocked from a program designed to help them because funding is running low. Obama administration officials said Friday that the state-based “high-risk pools” set up under the 2010 health-care law will be closed to new applicants as soon as Saturday and no later than March 2, depending on the state.” This is just more evidence that Obamacare is a dismal failure– it was marketed as a miraculous solution to America’s healthcare problems, but was dependent on non-existent funding.